Installing the Google Search App for Windows 8 can help you bridge the gap between old and new Windows. I just started using the Google Search App so I can’t comment on any hiccups – none yet – but it seems smooth and easy. The Google Search App works on Windows 8 and Windows 8 RT which will be handy for Surface RT and other RT tablet owners. Google Search App does not fix the Windows 8 Flash problem. If you land on a Flash page that Windows 8 will not display, the Google Search app suggests using the default browser. If the new Internet Explorer 10 is the default browser that does not fix the problem. To get Flash you need to revert to the Desktop Internet Explorer 10 or Firefox. For Chrome users, there is also a Chrome App which I didn’t test. Since Windows 8 controls how apps install, if you don’t like them, it is easy to uninstall. 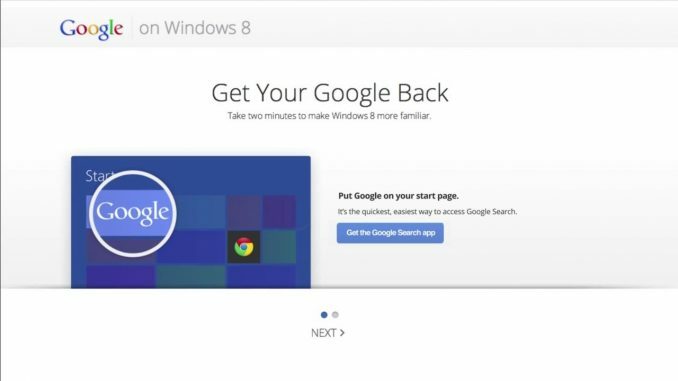 Google has a short video, set to the Jackson Five “I Want You Back”, demonstrating how easy the apps are to install. Sweet.